Learn sideline cheers, motions, basic, tumbling (cartwheel and forward roll), and beginner stunting. Teams and coaches will be organized in the spring. Registrants after the deadline are not guaranteed placement on a team. Season: Late August – early November. When you pick up your uniform, you will be required to leave a $150 security deposit (check payable to WTYFC). At the end of the season when the WTYFC uniform has been returned, clean and undamaged, we will return your check. Perform sideline cheers at tackle football games on Saturday or Sunday. Teams and coaches will be organized in the spring. Team size will not exceed 15. Registrants after the deadline are not guaranteed placement on a team. Parents are encouraged to volunteer to coach a team or serve as team manager. Practices: Practice two times per week for 1 hour beginning September 5th and going through early November. Tentative: Tuesdays and Fridays. May change to accommodate coach’s schedule. Games: cheer at tackle football games on Saturday or Sunday. Schedule is released by the league in late August/early September. Travel is required to away games (Darien, Fairfield, New Canaan, Ridgefield, Easton or Wilton). Friday Night Lights: Optional participation in the Trojans Tunnel at Home High School games and may have the opportunity to perform. Optional: Cheer sweatshirts and sweat pants will be available to purchase. Please consider these for colder weather as it provides uniformity on game days. Uniform fitting for early registrations will be scheduled before the end of school in June so items ordered can be received before cheer season starts. 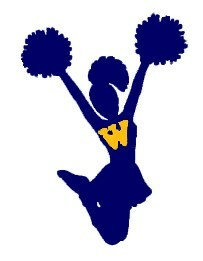 Weston Cheer is offering sideline cheer only.